As organisations grow and become more successful they also inevitably need to expand office space to accommodate a larger team. Unfortunately as the facilities and offices grow, so does the wastage of resources – with power consumption fast becoming one of the key areas of concern. But getting people to change how they view and manage non-renewable resources like electricity is always going to be an uphill task for facilities and management teams. Fortunately intelligent sensors can help solve this problem automatically and intelligently – if they are used along with dimmable light sources. 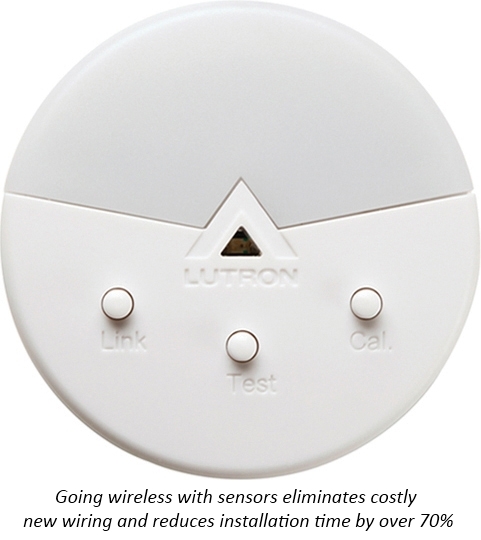 Lutron, a world leader in lighting management, offers Radio Powr Savr wireless daylight sensors that provide convenient light control and are engineered for optimum energy savings and easy installation. Radio Powr Savr wireless sensors can be deployed in rooms which receive natural light to save energy by directing compatible wireless lighting controls to reduce lighting levels based on available daylight. Rooms with a lot of windows or skylights in the ceiling are usually good candidates for the use of these sensors. This battery-powered, ceiling mount sensor saves energy by dimming or turning off electric lighting when sufficient daylight is available. The sensor detects light in the space and then wirelessly transmits the appropriate commands to the compatible dimming and switching devices via Lutron Clear Connect Radio Frequency (RF) technology; those controls then adjust the lights to take advantage of daylight. Whole Building: The daylight sensor can also be incorporated into Quantum system through the QS Sensor Module to automatically adjust the light levels according to the amount daylight available in multiple spaces and provide total light management of an entire building.